The article can also be found at http://seekingalpha.com/article/3966410-fireeyes-future-prospects-bright-investors-avoid-stock. If you have any questions/suggestions, feel free to contact me anytime. Thank you. FireEye acquired four companies in the last three years. Issued nearly $900 million in debt and continues to lose money. Possible secondary offering, diluting shareholders’ equity further. Founded in 2004, FireEye (NASDAQ:FEYE) has grown exponentially. The importance of security is extremely vital, and the demand for security continues to increase as cyber attacks increase and the world becomes more connected. In 1988, after four years from the Macintosh introduction, the Internet’s first ever worm virus hit the computers. The Morris worm – one of the finest recognized worms to affect the world’s nascent cyber infrastructure – changed everything. Bugs in the code caused hundreds of systems to slow down and crash. Computer security was then no longer a science fiction. FireEye stands out in the global Specialized Threat Analysis and Protection (STAP) market. According to research firm IDC, FireEye had 37.9% of the nearly $1 billion STAP market in 2014, seven times greater than its closest competitor. The $930 million STAP market grew 126.3% from 2013. By the end of 2019, it’s expected to reach $3.14 billion, compounded annual growth rate (CAGR) of 27.6% from 2014 to 2019. From the STAP market alone, FireEye generated $353 million in revenue, a 119.2% growth year over year (Y/Y). The STAP market revenue accounted for a whopping 82.86% of FireEye’s total $426 million revenue in 2014. If the company can maintain its 38% of share by 2019, it could be generating about $1.2 billion in revenue from that market alone. While these are great news, there’s a disappointment. FireEye’s 37.9% share of the market in 2014 declined from 43.1% in 2013 due to a growing competition, notably from Palo Alto Networks (NYSE:PANW). In April 2014, Palo Alto Networks acquired Israeli cyber security start-up Cyvera for nearly $180 million. In September 2014, it introduced Traps, an endpoint STAP product that was built on the technology from Cyvera. In December 2013, FireEye acquired Mandiant, a leading provider of advanced endpoint security products and security incident response management solutions, for approximately $1.02 billion in cash and stock. Mandiant is well known for a report it published in February 2013, detailing a secretive Chinese military unit believed to be behind a long list of cyber attacks on U.S. companies. The combination of former FireEye, attack detector, and Mandiant, attack responder, came after the Snowden leaks in June 2013. The marriage between them created a major force in the cyber security industry. According to a report by Cybersecurity Ventures, the global cyber security market is expected to grow from $106.32 billion in 2015 to $170.21 billion by 2020 at a compound annual growth rate of 9.8%. In its cyber security 500 list of the world’s hottest and most innovative cyber security companies, FireEye came in first. 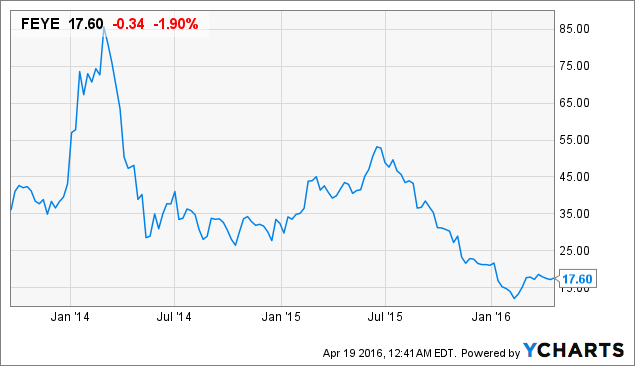 While FireEye may be the hottest, its stock is the ugliest. The share price of FireEye was down 35% last year while the NASDAQ 100 Technology sector has declined 2.8%. Since hitting an all-time high at $97.35 on March 2014, the stock is down 82%. The stock hit all-time lows on February 12th – the day after the fourth-quarter earnings report – at $11.35. Since then, the share price is up 55% at a current price of $17.60. In May 2014, FireEye acquired nPulse Technologies, a privately-held network forensics firm, for $56.6 million. nPulse specialized in the analytics of a cyber attack and how the attacks may have affected the networks. nPulse was a partner of FireEye prior to the acquisition. It seems FireEye benefited from the partnership with nPulse. The combination of Mandiant and nPulse gives FireEye an all-encompassing security framework. In January 2016, FireEye acquired iSIGHT Security, a cyber threat intelligence solutions provider, for $200 million. iSIGHT is memorable for its discovery of a zero-day vulnerability – a hole in a software that is unknown to the vendor – affecting Microsoft (NASDAQ:MSFT) devices. It was used by Russian hackers to hijack and snoop on computers and servers used by NATO, the European Union, telecommunications and energy sectors. FireEye expects iSIGHT and Invotas to add approximately $60 million to $65 million to 2016 billings and approximately $55 million to $60 million to 2016 revenue. That alone would bring 7.52% to 8.15% growth to the billings Y/Y. Revenue would grow 8.83% to 8.63% Y/Y. For the year ending December 31, FireEye expects revenue from $815 million to $845 million and billings from $975 million to $1.1 billion. 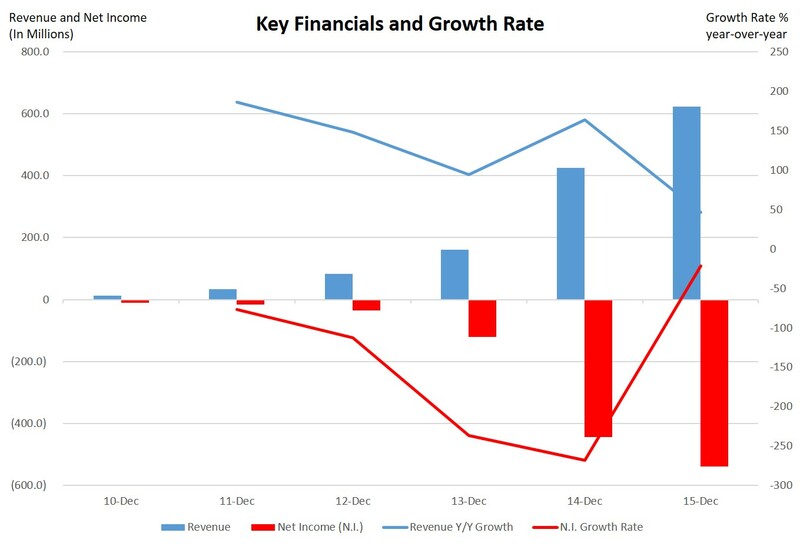 If the revenue grows as expected, it represents a growth of 31% to 36% Y/Y, and the billings would grow 22% to 32% Y/Y. After subtracting the revenue growth from iSIGHT and Invotas, organic growth would range from 22.85% to 28.48%. Of course, that does not include other acquisitions. The question is what is FireEye’s real organic growth? At the end of 2015, the company had $402.1 million in cash and cash equivalents, up from $146.4 million in the end of 2014. 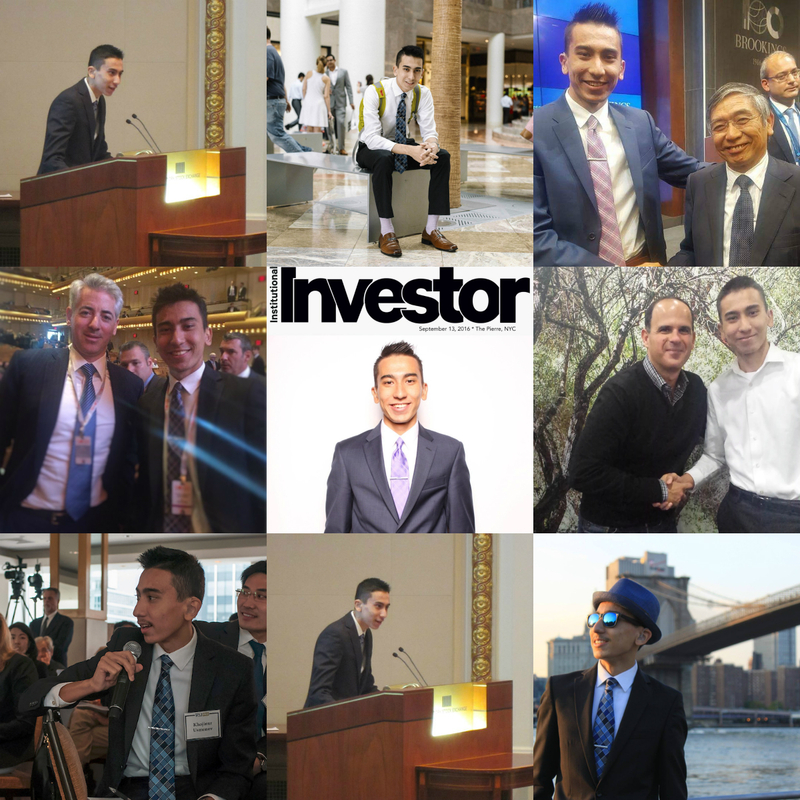 With short-term investment – which can be liquidated in less than a year – of $767.8 million, total cash and ST investment adds up to $1.17 billion, an increase of 190.86% from $402.2 million in 2014. Most of the increase in total cash can be attributed to the issuance of debt last year. In 2015, FireEye issued a total debt of $896.5 million. It currently has $706.2 million in debt, which I expect to increase as the company continues to lose money. FireEye believes the existing “cash and cash equivalents and short-term investments and any cash inflow from operations will be sufficient to meet our anticipated cash needs, including cash we will consume for operations, for at least the next 12 months.” But, I do not take its word for it, considering the company loses about $135 million every quarter, or $500 million in a year. In addition to the issuance of debt, total stockholders’ equity decreased to $1.04 billion in 2015 from $1.25 billion in 2014, as the amount of common shares increased 8.8 million to 162 million. As FireEye continues to lose money, it is possible it might do a secondary offering, which will dilute shareholders’ equity further. One sign that FireEye is investing into the future is its workforce. At the end of 2015, FireEye had approximately 3,100 employees, up from 2,500 in 2014 and 1,678 in 2013. Growing workforce shows the company is optimistic in the future. Make no mistake, FEYE is clearly positioning itself to take a bigger share of a growing industry. I believe FireEye is a great company that has the potential to succeed in the growing security market. But, it is too early for me to be optimistic in its future stock performance, as it continues to lose money and possible secondary offering this year. FireEye is due to report its first-quarter earnings on Thursday, May 5th. Additional disclosure: All information I used here such as revenue, etc are found from FireEye’s official investor relations site, SEC filings, and Bloomberg terminal. 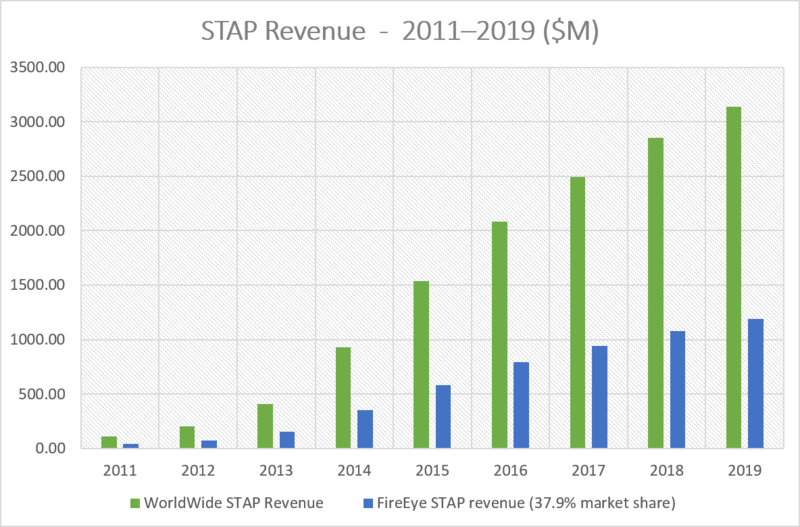 The pictures you see here including “FireEye’s Key Financials and Growth Rate” and “STAP Revenue – 2011-2019 ($M)” are my own.